GESCO is dedicated to working with medical device manufacturers and suppliers around the world to develop and manufacture innovative, value added, quality products and solutions. 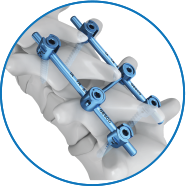 GESCO offers a wide range of surgical instruments used for orthopaedic and spinal procedures. Our skilled team develops the products to our clients’ exact requirements, whether you require a modification of an existing instrument or an entirely new design at competitive prices, designing them after developing operational prototypes that ensure quality control at every stage. GESCO also manufactures machine components ranging from simple components to complex devices. Core capabilities include Implant Systems, Spinal, Mono and Poly-axial, Connectors, Cages, Maxillofacial and Neuro Plates and Screws and Implant Insertion Instruments. GESCO houses Multi-axis turning Centres, Multi-axial Milling machines, EDM, CNC wire cuts, Laser Markers, Laser Cutting, Forging Hammer and Silicon Moulding Machines etc. GESCO has significant experience in working with premium medical grade materials such as Titanium, Stainless Steel, PEEK, and Silicone. Experience gained in medical devices manufacturing puts GESCO in a position to manufacture for other companies as Original Equipment Manufacturer (OEM) or Contract Manufacturer. We undertake custom manufacturing for clients right from Medical Devices to Aerospace components. Bone probes are made of stainless steel with soft grip, silicone handle. Different types of AWL and bone probes are available including straight, curved, taper, etc. Rod Holders are available for all sizes of rods. Power rod gripper and the Jaws can be customised as per customer requirement and size. The Rod holder is available in Straight, Pivet Tipped, Hinged and Kerrison type Ratcheted. Rod Reducer are offered as Threaded Rod Reducer, Rigid Rod Reducer Ratchet and Rod Compressors. At GESCO we specialise in manufacturing and supplying the different variants of silicon handles based on customer preferences and requirement. We design the 3-Sided Handle, Mini 4-Sided Handle, Large Long 4-Sided Handle, Compact 4-Sided Handle, Small Round Handle, Mini Rounded Small Handle, Large T Handle, Palm Handle, Palm Handle, Small Ball Handle, Large Ball With Flat, Both Sides Flat Handle Small, and Both Sides Flat Handle Medium and Large. We manufacture Parallel Distractor and Parallel Contractor. The unique design of the distractor and contractor is that the it works in ratchet as well as in screw rod. The TLIF and PLIF Instrument consists of a very wide range of preparation instruments like Bone Curette Straight, Bone Curette Angled, Bone Curette Left and Right, Bone Curette Reverse Angled, Bone Curette Serrated, Bone Ring Curette Straight, Bone Ring Curette Left, Bone Ring Curette Right, Bone Box Curette Straight, Bone Box Curette Left, Bone Box Curette Right, Osteotome Straight, Osteotome Angled, Impactor Straight and Curved, TLIF Trial Block, PLIF Trail Block, Disc Space Distracter and Nerve Root Retractors. GESCO manufactures various types of ball probes in straight Ball Tip Probe, Curved, and Double Ended Bal Tip Probes. The ball tip in the distal end gives the surgeon the desired feel when probing around the pedicle and the nerve root. The pedicle marker candle helps as a marker. The depth marker is used to determine the length of the screw to be used. We can manufacture sterilization trays as required by customers.